Hellouu Gorgeous – It's Time to Shine! Some answers were more intriguing than others like my colleague who said she wanted to be a truck driver because she enjoyed the silence and scenery the U.S. roads offer (I bet you never heard of anybody claiming that as their dream job, huh???). Other answers shared around the table were to become a movie star, a singer, or a professional athlete to enjoy the perks of sponsorships, fame and money. I said that my dream job would be to post photos, share experiences and best practices with others, and talk about things I love doing in my ordinary life. In other words. . . I said I wanted to be a blogger without knowing that’s what a blogger ultimately does. (Silly me. . . I know!). After almost one whole year of telling my family I wanted to start my blog, I am finally here -taking a step forward, and putting my thoughts into action. I look forward to sharing with you experiences and best practices of my everyday life, and hope you become inspired to conquer the world, live your dreams and challenge yourself to become a better and improved version of yourself! Throughout this journey remember to follow the sun, the moon, the stars, your dreams, your goals and your heart to find out where they take you! You’ll never know if you don’t give it a try. 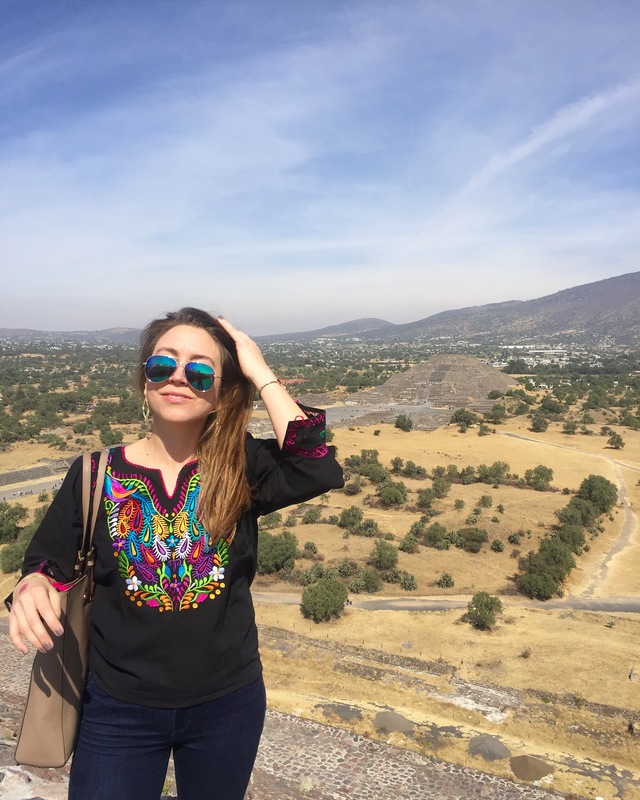 One of the ultimate Mexican experiences you will EVER have while in Mexico is definitely hiking the pyramids of the Sun and Moon in Teotihuacan. I’ve been to the pyramids three times in my life: once as a kid with my family, a second time with my classmates for a Cross-Border class I took in college, and the third time I went with my boyfriend. Every time I’ve visited the pyramids I’ve traveled with foreigners -whether it was my mother and my grandfather, my classmates or my boyfriend, they’ve all walked away mesmerized by the mystique symmetry of these monumental man-made creations. It is mind-blowing to think cement and construction machinery were non-existent back when the pyramids were built, but what’s more incredulous is that unlike several modern buildings in Mexico City, the pyramids have survived two major earthquakes and are still standing to date! 100% Guarantee! Exploring Teotihuacan will be one of the best journeys you will ever experience in your life. That’s why you need to go and check it out for yourself! Hours: open from 9:00 a.m. to 5:00 p.m. all days of the year. Entrance Fee: $70 MXN pesos. Make sure you hold on to your ticket to enter the museums inside the park. Videocameras cost an additional $45 MXN pesos. Journey: The Death Valley is a South to North path, about 4 KM long, that will take you through the archeological park. My biggest recommendation is you start at the South entrance of the park and work your way up. You don’t want end up walking North to South and back to the North again. The walk from the citadel to the pyramids is a pretty long haul, trust me you do not want to make the same mistake as me and walk it twice. There is no need! To see a map of the site click here. Unfortunately, the site is only in Spanish, but you can get a good idea of where these places are situated on the map so you are able to navigate through the park. If you followed my hotel recommendation in my post “Why Mexico City Should be Your Next Adventure Destination,” Teotihuacan is nearly 50 KM from Hilton Reforma Mexico City –about a 60 to 90 minute drive (subject to the level of traffic). Be sure to ask your concierge for more information on Teotihuacan Tours to book your excursion! Shoes. You must be prepared for a long day of walking and hiking! The ground is mostly rocks and dirt, and the stairs on your way up the pyramids are very narrow. I know we all have really cute shoes that hurt our feet, that we still wear despite the painful fact! However, don’t wear them. I cannot stress enough how much you will regret it! Wear comfy flat shoes –may it be tennis shoes, sneakers or any derivative of this sort. Attire. It depends what time of the year you are going, but you are bound to experience a mix of chilly and warm weather that same day. To be safe wear any variation of leggings, shorts, jeans and a loose blouse or T-shirt to keep you warm if it’s chilly in the morning, and stay cool should the temperature rise throughout the day. I don’t recommend dresses at all since you will be going up many narrow stairs and it can be windy –you don’t want to show all Mexico what you are wearing under (this is a Mexican expression we use whenever your undies get seen LOL). Cash. Remember what I said about getting cash in “Why Mexico City Should be Your Next Adventure Destination,” ? Well… guess what?! You will most definitely need cash at Teotihuacan. Typically, none of the vendors at Teotihuacan accept credit cards, so if you want to buy hand-made souvenirs you should bring MXN pesos. Yes, things are cheap in Mexico, but things add up quickly so bring enough to cover your expenses, plus your souvenirs. If you are going to carry a significant amount of pesos (anything above $2,000) you don’t want to put it all in one place; keep some bills in your wallet, and others in your pocket. Essentials. Whether it’s a backpack or a purse, just make sure you bring something that allows you to carry all your essentials like sunglasses, sunblock, snacks, water bottles, cell phone, camera, an extra blouse or a sweater. I took a purse, and honestly, I think it would have been better to carry my things around in a small backpack. You will notice there are a lot of small restaurants near the entrances of the archeological park, but take note of this place I am about to recommend: La Gruta, “The Grotto.” Eating at this restaurant will only enhance your ultimate Mexican experience; it is truly one of a kind. Location. La Gruta is about 15-20 minute drive away from the archeological park of Teotihuacan. You can grab a taxi and ask them to take you there for a few MXN pesos. Food. There are so many authentic, delicious Mexican dishes here, it will be hard to decide what to order. I can help you narrow your decision-making by confirming that the “consommé de cornero, “beef broth soup,” and the barbacoa plate, “beef,” are two excellent choices on the menu. If you any questions about the menu, some of the waiters speak really good English, and are very helpful. *Note: if you REALLY want to be adventurous, ask for an appetizer of chapulines, “crickets.” I kid you not… they are delicious -a bit salty and crunchy. My recommendation to you if you decide to eat them: Don’t think about the cricket and don’t look at it, just toss in your mouth and enjoy the flavor! Drinks. I ordered the mezcal de chapulines which I believe is off the menu. I literally thought this cocktail would have crickets swimming in my mezcal drink. Thankfully, the crickets were blended into the mezcal. If nobody told you you are about to have a cricket drink, you wouldn’t even know it’s a cricket drink! This has been one of my most favorite mezcal drinks; it was AMAZING!!! I highly recommend it. *Note: make sure you have a sweater packed because this place can get a bit chilly even on a hot, sunny day. Well people… I hope these notes about Teotihuacan motivate you enough to go experience it yourself. Keep us posted on your trip and share your best experiences with us. I look forward to hearing all about it! I am sure we’ve all heard our parents say “money doesn’t grow on trees,” and isn’t that a sad truth. That’s why you need to work hard and save money! You might remember one of my previous articles, “Every Penny Adds Up: Save Your Credit Card Change,” where I talked about a new and convenient way of saving money on the Acorns app. I’ve been using Acorns for three full months and wanted to share with you my results. Thus far, from January to present, I’ve saved $737.02! I’ve earned $25 in referrals, $300 from monthly deposits, and the remainder is the change from my credit card transactions. If one of your New Year resolutions was to start saving money, and you still haven’t saved a penny, it’s never too late to get started! A really easy way to get back on track is using Acorns. I downloaded this app the first week of the year and started saving instantly with the round-ups feature. All you do is link your credit card(s) to your Acorns account and every purchase made on your card(s) will be rounded up to the nearest dollar; this money gets deposited into your Acorns account from your checking account. It’s a really convenient way to start saving up those pennies. Trust me -they add up quickly! Based on my experience, I will share some tips and tricks to help you grow your savings at a faster rate. I hope these work for you too! Earn $5 for every time you refer this app to a friend and they open their Acorns account (you and that person will each get $5 deposited to your respective accounts). Earn a bonus when 5 of your referrals open an Acorns account and start investing before the end of April (Acorns investors will split a $100,000 pot!). Earn money on your money (yes, that is correct!). Acorns invests every $5 you accumulate from your round-ups into a protfolio of stocks and bonds which in return can earn you more money for the money you are already saving! Note: your money’s growth rate will depend on what type of investment portfolio you chose (mine is “moderate”), and how much money you continue to add into your account. (But heyyy… at least your savings will be earning more than .01% for every dollar saved unlike my personal bank account)! The Round-Ups feature can be incremented from 1X to 2X, 3X up to 10X the amount from your transaction’s round-up (I personally have upped mine to 2X –but start out with 1X just to understand how this feature works). Set up monthly deposits, even if you start with $5 a month, it all adds up! I decided I could afford $100 monthly deposits; my brother decided he would deposit $10 into his Acorns each time he didn’t spend money on his lunch. How much you despot is totally up to you! Just so that you know. . .there is a $1 monthly fee for all accounts with a balance under $5,000 and .25% of the balance per year on accounts over $5,000. Another cool feature is their “Found Money” where you can make purchases with some of your favorite vendors and suppliers, and have a percentage of your purchase deposited back into your account (this is deposited between 90 to 120 days after the purchase date). For instance, I recently made a $54 purchase from “Forever 21” through Acorns and 4% of my purchase will be deposited back into my Acorns! Some other vendors deposit a specific dollar amount into your account, it just depends on what each store offers. No more excuses allowed, download Acorns on your phone. The app is secure –my brothers, some friends and colleagues, and I already started. Don’t wait any longer and get your own Acorns account! By all means, I am not saying that I am a professional financial advisor; I am just sharing my experience from using Acorns as a savings and investment tool. P.S. Earn your first $5 when you download Acorns. Click on any of the hyperlinks in this post from your phone. Literally… Mardi Gras is the synonym of New Orleans! Every year, tons of thousands of people from around the world come visit “The Big Easy” (one of several nicknames given to NOLA) to celebrate “Fat Tuesday”, and pack Bourbon St. while catching beads, drinking hurricanes, and collecting doubloons (the Mardi Gras coins). I am 100% positive you’ve heard of this big festivity! No doubt, NOLA (New Orleans, Louisiana) is definitely another city you must add to your “bucket” list! However, please beware that visiting New Orleans during Mardi Gras can get a LITTLE (notice my sarcasm?) overcrowded and a BIT (notice it again?) crazy. Sooo… if you’re like me, and you don’t like squirming through the masses like a sardine, this is NOT the time for you to visit this charming city. My boyfriend and I recently drove to New Orleans for a friend’s wedding and managed to fit in some time to explore the area. Despite the fact it was an ordinary weekend (no special holidays or events going on), we still (somehow) ran into a lot of traffic before getting to the French Quarter -where our hotel was located. Fortunately enough once we checked in and valeted the truck, the fun begun! As I have previously shared with you, I don’t have too many vacay days therefore my trips are typically limited to weekends, which means I need to maximize each trip to its fullest capacity by doing the most in the least amount of time. If you’re in desperate need of more vacation days but have to suffice with what you got, I think you will find my advice a little (I hope for very!) helpful. 1. French Quarter. Thankfully the Omni Royal Orleans hotel (a block away from Bourbon St.) was located in this area and everything was walking distance -we truly didn’t need a car to get anywhere! The only transportation I recommend taking (if you have time) is a horse/mule driven carriage -it’s the most authentic way to tour the French Quarter! (Tickets can be bought on the spot, make sure you shop for the best deal by asking around before you buy). The Old Absinthe House. The oldest speakeasy in the French Quarter, dating back to the early 1800s offers a unique, mystique experience at Bourbon rue. Their menu obviously consists of a variety of “Green Fairy” drinks -remember to drink within your limits. (I’d never had absinthe in my life so I asked the bartender for her recommendation; she advised me to try the Butterfly drink). Erin Rose. A few steps off of Bourbon St. you will drink the BEST Frozen Irish Coffee you have ever had! Pat O’Briens. You cannot leave this street without ordering one of NOLA’s signature drinks -the Hurricane! Fat Cats. This bar has a live band, playing your biggest hits of the 80s -it’s the perfect spot to drink and sing-along with the frenzzz! Big Easy Daiquiris. If you are searching for quick and tasty food, this place is legit! Their pepperoni pizza was beyond AMAZING -so good it does not compete with Costco Pizza! Plus, they have a frozen bar and you can order whatever flavor you want! This place was our savior! 4. Saint Louis Cathedral. Hopefully you’re timing will be better than ours; we didn’t get to see the cathedral on the inside. (A little secret about myself -when I travel I love to check out churches and make a wish for every new church I visit). ~Amelie Café. This is a neat spot to have a long brunch. Unfortunately for us, it was only drinks at the bar. If you want to eat here, I highly recommend calling in to make a reservation; walk-ins are accepted but are limited -so don’t risk it and call in. ~French Market. I hope you’re in financial shape to walk through six blocks of non-stop shopping! Here you will find anything from cajun food, local art & art crafts, used books, unique apparel, handmade jewelry and much more! Have your credit cards available and ready for a fun shopping spree! ~Hot Sauce House. If you get sick of waiting in line to be seated at Café du Monde, walk across the street to check out this store -they have a wide selection of hot sauces to sample; hopefully you have a high tolerance for “picante” -some of their sauces are very spicy! ~Fiorella’s Bistro & Wine Bar. After passing up restaurants with long waiting lists, we discovered Fiorella’s, a bistro that served excellent raw oysters marinated in champagne-wine (not on the menu), and very moist, charbroiled oysters. I really liked this place to grab a quick bite and keep moving forward. I hope you get to checkout all the places I’ve listed and you get to see way more than I did! Make sure you share any other pieces of advice you pick up during your trip here. Not needed when your only a drive away! If you are further away than just a few hours, search for your best flight deals on Expedia.com, Priceline.com, or visit directly the airline websites such as United.com and/or Southwest.com. Location. Making sure your hotel is in a safe area is always important (safety first!). Additionally, when you are visiting a loud city, it is nice to find a place where you can find peace and quiet to get a good night’s rest. Comfort and Quality of Service. Comfy beds with clean, fresh sheets, at a high end hotel calls for good night’s rest. The hotel staff was very welcoming and friendly which always makes a difference during your stay! Proximity. Being able to walk to all the hot spots around town is a major convenience when you’re out traveling! We wanted a hotel that would allow us to spend most of our time exploring new sites, such as the ones I’ve listed. The Omni Royal Orleans was the hotel of our choice based on this criteria. Located on Saint Louis St. (a few steps away from the busy Bourbon St.), the Omni Royal Orleans offers a friendly, relaxed, and luxurious atmosphere -perfect for a fun getaway weekend! Overall the staff provided great customer service. Check-in and -out were quick and easy; which we all know can sometimes be a nightmare and delay the beginning of your fun or your journey. Based on the experience of our stay, I rate the Omni Royal Orleans with a full five yellow stars. You should TOTALLY check it out for yourself and let me know what you think! Like I said, everything is walking distance within the French Quarter. If you really need a ride to get somewhere you should truly take a carriage tour around town. 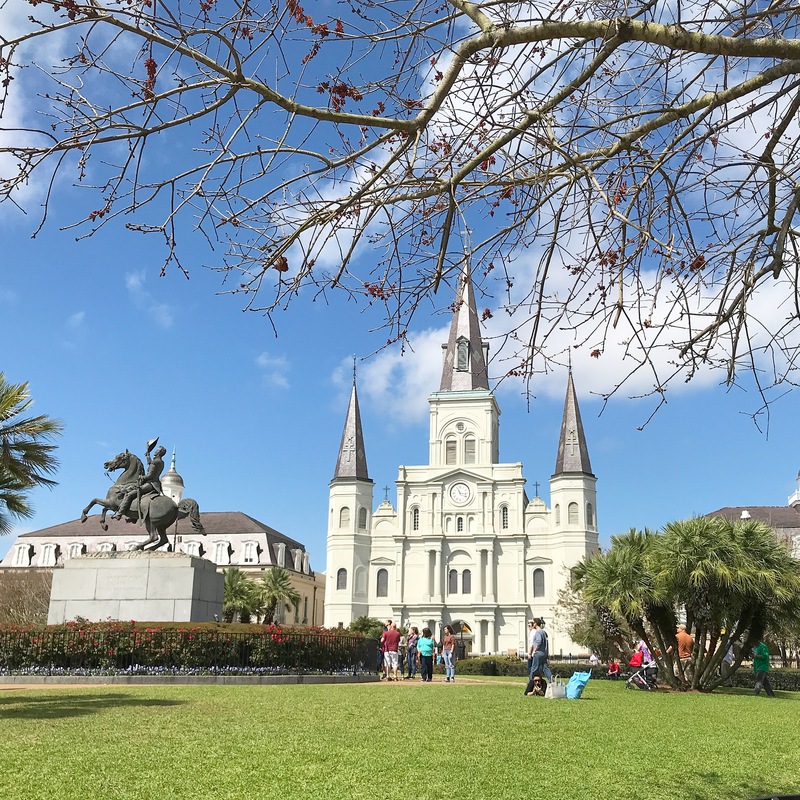 Wherever the streets of New Orleans take you, please do not leave the French Quarter without visiting these places! ~Bourbon House. Take this as my best recommendation! This restaurant/bar has an amazing showcase of all types and kinds of bourbon -I think your drink for the night is quite self-explanatory. This restaurant’s ambiance is graced with elegance, and their food is served very rich in flavor. Please, please don’t walk away from Bourbon House without trying their charbroiled oysters -they are exquisite! By the way… they prepare a delicious vanilla, whiskey shake you must order -remember, don’t be counting calories! (No room for diets when you’re on vacation LOL). ~Café Beignet. Everybody that visits New Orleans has their mind set on visiting Café du Monde ( in Jackson Square) to order a café au lait -coffee with milk- and an order of beignets -Google it if you don’t know what they are. However, people typically don’t know about the 2+ hour line you need to go through to be seated! (So soo crazy!). If you have all the time in the Monde (get it? LOL), then by all means be patient and wait to be seated. But, if you are on the “go” and want to have just as good of an experience, definitely visit Café Beignet! ~Hotel Monteleone. One of the fanciest hotels you’ll find in the French Quarter is famously known for its Carousel Bar & Lounge -which by the way, does spin around! (FYI: You don’t need to be a guest at this hotel to sit at their bar and order a drink! Oh yeahhh… no reservations required either!!). For drinks, I suggest ordering “The Corpse,” a cocktail off the menu that another person sitting next to me at the bar recommended; a Sazerac -which is a variation of cognac and whiskey- if you like strong drinks; or a French 75, a very refreshing type of mimosa -made with gin and lemon juice instead of the usual orange/grapefruit juice. I ranked these three locations as the main highlights of our trip; be sure you check them out and share your thoughts -remember to take it easy on the drinks (LOL)! If you have any questions on other topics, please feel free to message me; I wish you the best experience ever at “The Big Easy.” Look forward to hearing all about your visit! Most of the time when I ask people if they’ve been to Mexico, their answer is “Yes!” However, once I ask them where in Mexico they’ve been, they typically respond: Cancun, Puerto Vallarta, or Cabo. (Are you included in this bunch? It’s OK, no worries!). I personally have only been to the first two that I mentioned, and I think they are GREAT for fun, vacation and relaxation! 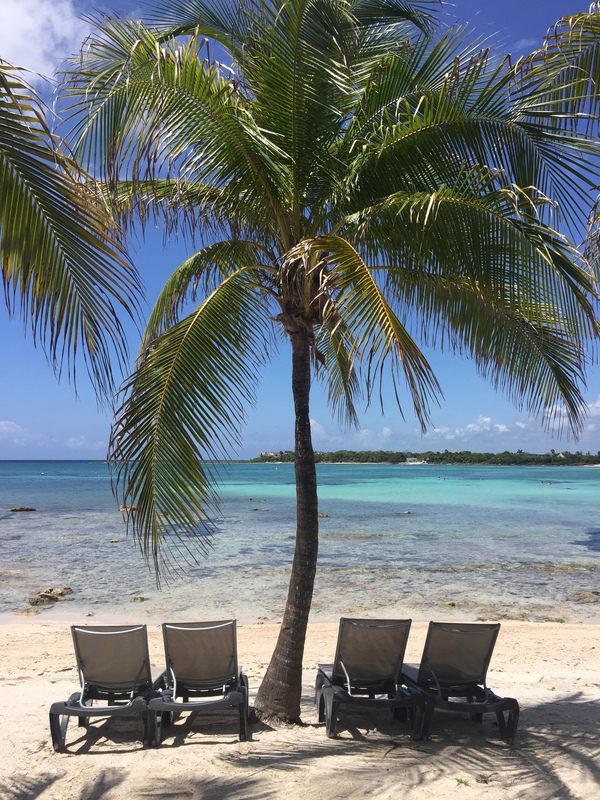 Nevertheless, you might agree with me and concur that these beaches even though very fabulous, they are a bit Americanized -which only means they’ve lost some of their Mexican flair and therefore don’t give you a real taste of Mexico! This might sound a little biased (partly because I am half Mexican), but… Mexico has some of the most beautiful beaches in the world -crystal clear waters and white-dusty sand make Mexican beaches a hot (literally!) destination for many national and foreign tourists every year. So, if your mission is to lay back, relax and catch some Vitamin Sea, Mexican beaches are a perfect fit for that purpose! BUUUT, if you are interested in experiencing the “true Mexico,” I highly recommend you visit Mexico City! 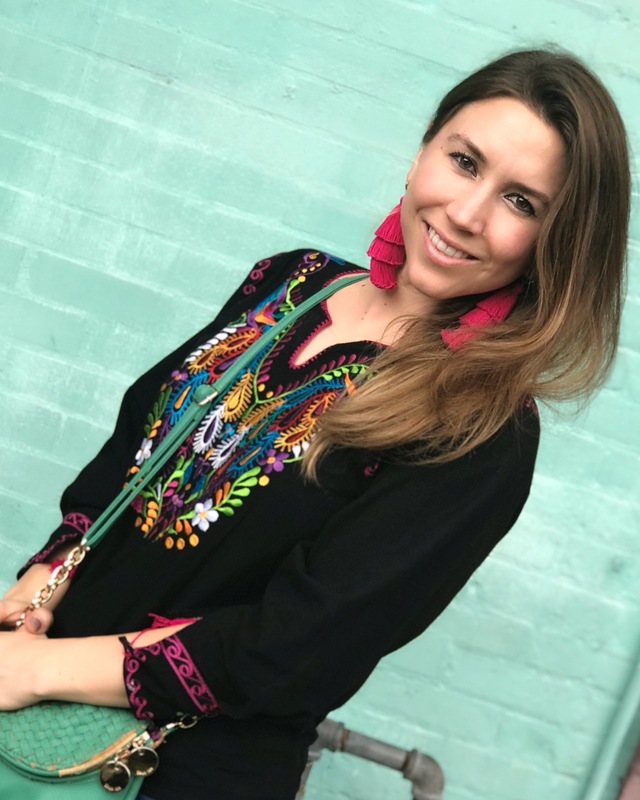 As you may remember in my “About” page I shared with you that my dad is Mexican, and part of my roots are deeply tied to the culture, customs and traditions of mi querido (my dear) Mexico. To be honest, flying into Mexico City can be really inexpensive given it is Mexico’s and Latin America’s busiest and biggest airport -so you should be able to find great deals as low as $255 a round trip with airlines like United Airlines or Southwest (that’s been the lowest I’ve found; if you can get a better deal that’s awesome!). Search for your best flight deals on Expedia.com, Priceline.com, or visit directly the airline websites of United.com and/or Southwest.com. Don’t be afraid to mix and match airlines either -I’ve done it in the past to reduce airfare costs, but if your a points person, stick to your preferred airline. Comfort and Quality of Service. Comfy beds with clean, fresh sheets, and some AC make it a suitable environment for decent sleep. Note: depending on the time of year it can get hot -VERY hot and not all hotels have AC! Proximity. It’s nice to be able to walk to most places when your traveling to not miss out on any sight-seeing! We wanted a hotel that was walking distance from the downtown area where we would spend most of our time exploring the sites I listed. Based on these three components we chose Hilton Mexico City Reforma which indeed is located on Paseo de la Reforma Avenue. Originally, our room was on floor 12, but at check-in we asked if there were other rooms available with a better view, and guess what?! We got moved to the 22nd floor with an amazing view of Alameda Central park (it was gorgeous!). Overall the staff was very friendly, spoke fluent English, and provided great customer service. We loved our bar-tender, too, he took care of us every evening after being exhausted from touring all day long. He recommended trying the “banderita” shots -a Mexican Flag shooter of lime juice, tequila, and sangrita (a traditional Mexican tomato juice served as a chaser to high-end tequilas). We (I know my boyfriend would agree with me), highly recommend this hotel if you intend to explore the historical downtown of Mexico City! If you stay nearby the downtown area, the only time you will need ground transportation is to get to and from the airport. Always request taxi’s through the hotel or at the airport terminal (right after you walk out from customs on the right you will see taxi booths). Those are registered taxi drivers that are safe to take. Unlike the US where everybody carries plastic to pay for everything, you will want to bring cash so you can change your money into Mexican (MXN) pesos at the airport. There are many exchange currency booths once you exit through customs, make sure you look around before you get suckered into one of the booths that doesn’t give you the most pesos for every dollar/euro (or whatever currency you are carrying). You will need MXN pesos to pay your taxi driver, tip the hotel staff, and meals at small or street restaurants. Also, if you are into bohemian fashion and love artisan clothes, purses, shoes, and jewelry, definitely bring more cash -you will need it! Credit cards are accepted in many places, like your hotel, established restaurants, and some shops, but just make sure you carry cash at all times. ~ Visit La Terraza at the Gran Hotel Ciudad de Mexico. This hotel (which by the way… you can stay here too!) has a rooftop restaurant and bar with the most SPECTACULAR views of El Zocalo. Make sure you go online to place a reservation or get there early to secure a spot! (You will have to go for a meal, they don’t let you order only a bottle of wine -this method was already tested by my boyfriend and I, and it did not get us in… LOL). ~ Walk across from the Hilton hotel over to the Alameda Central park at night to shop for handmade clothes, or try some of the authentic Mexican street food -you will love it! Carry your wallet in your front pocket, or your purse in front of you. Ladies keep your purse at sight at all times. Don’t carry all your cash with you when going out for walks and avoid wandering into lonely, sketchy areas. Leave your passport locked up in your hotel room’s safe. Like in any big metropolitan city, be aware of your surroundings and use your good judgement; stay away from areas that don’t look so touristy. Other than that, go out and explore this beautiful historical city! Hopefully this post wasn’t too long; I really tried to keep it short and straight to the point, but I wanted to make sure to not miss any important pointers to ensure you can make the most out of this wonderful trip! If you have any questions on other topics, please feel free to message me! I really want you to have a great experience in Mexico! Let me know how your trip goes and what you liked most about your visit. 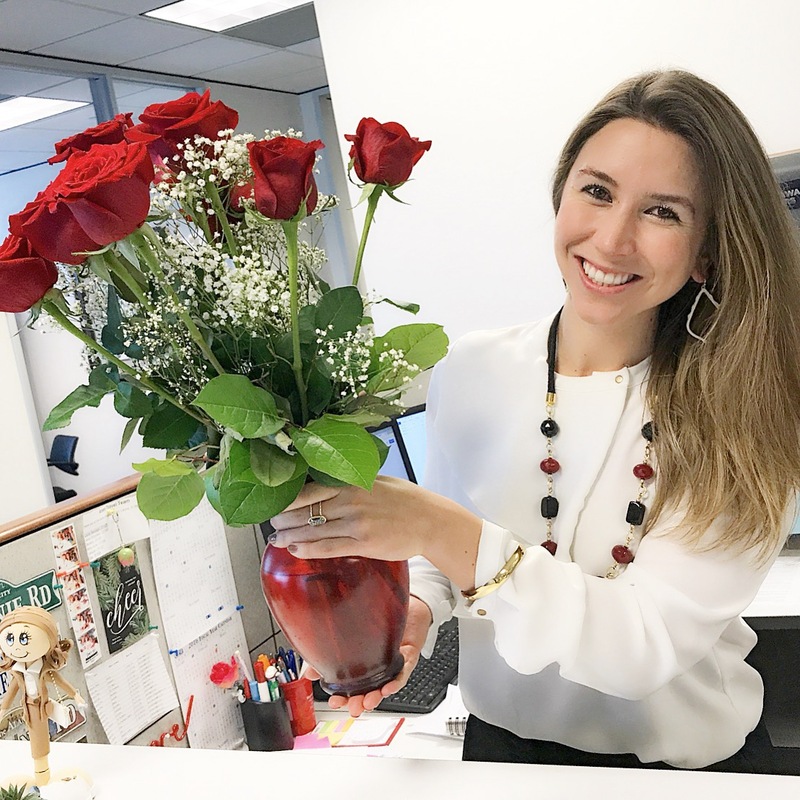 Whether your relationship status on Facebook is Married, Single, In a Relationship, It’s Complicated, or you don’t know what the heck is going on, flowers (more specifically roses) are always a GREAT present to gift that special someone! To be honest, roses are a wonderful gift no matter the occasion -birthdays, anniversaries, Valentine’s Day, Mother’s Day, or just because. All women, regardless of age, love to receive roses because they make us feel special! (I can see you nodding your head already!). Roses are a guaranteed smile; whether it’s one rose or one dozen roses, you can never go wrong! Now that we are on the same page, and we agree that roses are a great gift, you might be wondering: “What color of roses should I gift to convey the right message?” Well… there are three main colors of roses that I will recommend you gift depending on your relationship status. Red Roses → are your classic roses for love and romance; they are universally symbolical for “true love” (how romantic!). So.. if your Facebook status is Married, or In Relationship, and you want to express a meaningful “I love You,” I highly suggest selecting this color for your pretty lady! Light Pink Roses → are associated with affection, as well as feelings of gratitude, appreciation, and happiness. If you’ve been “dating” someone (whatever that means nowadays), this color is a safe choice to leave a clear message that you like the girl and would like to continue going out on more dates. Yellow Roses → are symbolical for friendship, joy and caring -appropriate to express appreciation and good wishes If your relationship status on Facebook is “Happily Single,” and you have many awesome girlfriends why not brighten their day with yellow roses! Roses truly are the thought that counts! I hope this short rose color guide helped you figure out the color of roses you are gifting on this special day. It’s not too late yet to run to your nearest supermarket and buy some -so hurry!!! Have you ever sat at work feeling so pumped and eager to start your day, and said: Nahhh I don’t need coffee today? Me neither!!! Every morning I go into work, and the day doesn’t start until I’ve had my first cup of coffee. It’s warmth makes me feel calm, and ready to take on any craziness I have to deal with at the office; and its strength makes me feel like I can get everything and anything done efficiently. On average, I need (at least) two cups of coffee to get me through the day: one in the morning and another one right after eating lunch. How do I take my daily coffee? Let me tell you… I do not drink the coffee served at the office (I can’t do it!). The first time I ever had a sip was the last I ever drank there. I’ve never been a fan of coffee brewed at any office, there’s something about it that just doesn’t taste right. Instead, I get a cup of hot water and mix it with Nescafe instant coffee, cinnamon powder, and some local honey. I know it’s crazy, but it tastes 101 times better than the coffee at work! Never heard of Nescafe? Ask any Mexican -we all drink it! It’s a brand of coffee made by Nestle which is a Swiss company, and it’s very popular in Mexico! It’s SO easy to prepare and it tastes great. I know there are other good brands of coffee out there, but I grew up drinking Nescafe since I was young, my dad drinks it, my uncles drink it, even my abuela (RIP) used to drink it -apparently it’s generational! I guess it might be part of the Mexican culture (who knows?!). The fact here is that four years ago I started contemplating the idea of eliminating coffee from my daily life (crazy -I agree!) to live a healthier lifestyle. You hear a lot of people say it’s bad for you, it causes insomnia or anxiety, and it can make your blood pressure skyrocket. So, I decided that before I took a step forward, I would do a little research of my own to make a more educated decision. Note: I do not suffer from high levels of cholesterol, nor high blood pressure. Although, I do have family members that have suffered from minor heart attacks and have high blood pressure. Other benefits are attributed to moderate coffee consumption according to Medical News Today. At the end of my research, I decided I would continue to enjoy my coffee with moderation -as we already know, ALL extremes can be harmful. I personally drink 2-3 cups a day, and get plenty of sleep, do not suffer from anxiety, nor hypertension, nor blood pressure. I believe in the benefits the studies suggest, and will re-evaluate articles in the future to confirm studies continue to see the same or even more benefits from coffee consumption. Remember we are all different; consumption will vary from person to person. Be aware of your limits and the effects that coffee has on you depending on your intake. By all means, I am not a certified nutritionist; I am only sharing with you my findings and my decision to keep drinking coffee. Valentine’s: Wine Not Try This? When I say ‘winery’, what’s the first place that comes to mind? Is it… Napa Valley? (I knew it!! I used to think the same too!) Californian wineries always came first to my mind, until my boyfriend took me on a proper winery tour in a German-influenced town called Fredericksburg -this charming town located in the Texas Hill Country completely changed my perception about Texan wineries! Obviously… the point of taking a wine tour is to taste all the wine you can drink! However, in order to get from one winery to the next to the following, you need a car. But if you drive a car, you’re not supposed to drink. This is a bit of a Catch-22 (isn’t it???). So, I bet you’re wondering: How the heck am I supposed to enjoy sipping on some wine, if I need to be able to drive to the next winery? I mean… yeahhh… you could definitely appoint your best friend to be DD, but you and I both know that is out of the question! Let’s be honest people… who wants to be a DD at a wine tour?! NoOobody!! 1. Grape Creek Vineyard should definitely be your very first stop since drop-offs are allowed up until 12 p.m. Be sure to become a VIP member -it really is a great deal! You get discounts on food, and bottles of wine, AND you get two free wine glasses. BONUS: You also get two complimentary glasses of wine at their store in town. (My boyfriend and I thought it wouldn’t be worth it in the beginning, but let me tell you… it truly was! This winery was my favorite of all!). 3. Wedding Oak Winery was another one I liked, too! This was a bit smaller and quieter location in comparison to the other two wineries, but very enjoyable and very nice to walk around. I hope you are able to visit more than five wineries; we did the tour only one day. But heyyy. . . if you’re feeling like a warrior, you should go on the tour a second day to finish visiting all thirteen wineries! We spent two nights at a lovely, rustic cabin ten minutes outside of town (an easy, quick drive) that my boyfriend booked through a property management company called Vacasa -pretty much something like Airbnb. This cabin was out in the middle of the wilderness; it was fully furnished and had two floors. The first floor had a small kitchen area and a cozy living room with a chimney to light up a real fire; the second floor had a king-size bedroom and a full bathroom. This bed & breakfast was perfect for a couple’s romantic getaway! But no worries. . . if you are celebrating Valentine’s with a group of friends, you can search for houses on Vacasa that can accommodate more than two guests. If you had enough wine on day #1 and wake up without a hangover, I recommend climbing the mystical Enchanted Rock! This excursion is a perfect way to end your tour on a some-what healthy note. The Enchanted Rock State Natural Area has several trails to explore with scenic views, geological wonders, and stunning beauty. This area has eight main points of interest of which we only had time to visit one (hopefully you can cover more ground than we did!). We climbed the Summit Trail for a little over half a mile up to Enchanted Rock. This hike offers scenic views and tranquility all around -it is so peaceful, I am sure you will enjoy this moment of peace and silence! Just so that you know… none of the pictures I took make justice to the amazing views of mother nature’s wonders. If you’ve taken this trip before and have other recommendations, please feel free to share! This is definitely a trip worth taking more than once -especially when you’re just a drive away! If you’re interested in saving money throughout the year, a really easy way to do it is with the Acorns app. I downloaded this app the first week of the year and have already saved up $54 with their round-ups feature. All you do is link your credit card(s) to your Acorns account and every purchse made on your card(s) will be rounded up to the nearest dollar; this money gets deposited into your Acorns account. It’s a really convenient way to start saving up those pennies –they could add up quickly! Besides helping you save money for that trip you urgently need to escape from work, or pair of stilettoes you can’t live without because they match perfectly with your new outfit, Acorns offers some other neat PERKS!!! The Round-Ups feature can be incremented from 1X to 2X, 3X up to 10X the amount from your transaction’s round-up (I personally have upped my account to 2X –but start out with 1X just to understand how this feature works). Don’t wait any longer and start saving today! To download this app to your phone click here. Note: this is a secure site –my brother, some of my friends and colleagues, and I already open our Acorns accounts and have liked the app thus far! By all means, I am not saying that I am a professional financial advisor; I am just sharing my experience from using Acorns as a savings and investment tool, helping me meet my goal of saving more money this year. P.S. This is not an “I love you” note, to download this app and earn your first $5 (WoOhoO!) click on any of the hyperlinks in this post from your phone. Easy Money: How YOU can earn it! I don’t need more money -said no one ever!!! If you love shopping, traveling, going out and enjoying a good time, this costs money and I know you wouldn’t mind some extra cash (just like me!) to enjoy more fancy shoes, adventurous trips, social happy hours, and cool experiences. Earn a total of 5% cash back on up to $1,500 in combined purchases each quarter in bonus categories that change every three months such as gas stations, grocery stores, restaurants, and other categories. (In other words you can earn up $75 each quarter for the advertised categories, and once you max out, you earn 1 point for every dollar spent). SECRET: Every year, from January to December, I use my cash-back credit card to accumulate points from all my purchases. From drinks, meals and groceries to bills, rent and insurance, I pay for everything and anything that I can with a credit card to earn as many points as possible. TRUE FACT: This practice has helped me redeem an average of $350 to nearly $400 per year!! (I typically use this “bonus” to shop for Christmas gifts).